I had promised myself I’d stay away from political blogging during the holiday season-–but there’s one recent development I just can’t refrain from writing about. This was one of the reasons I retired—more time for politics. So here goes: my last political post until after Jan. 1. Thanks to Azavea, the web-based software design firm that developed the Redistricting the Nation project, we now have the demographics of the old and new Pennsylvania congressional districts. Across the state, most of the changes in racial composition were relatively small—generally no more than a few percentage points. The only other district which had significant change was the 14th congressional district, which contains the entire city of Pittsburgh. In the 14th, the percentage of white voters was 69.4% % in the old district, 77.37% in the new; the percentage of black voters was 24.5% in the old district, 16.53% in the new. The shift in racial composition in the 14th is not as dramatic as in the first congressional district and it does not change the racial dynamics of the race. The 14th district was and remains a district which favors the election of a white candidate. The first district has gone from a district which was very favorable terrain for a black candidate to one in which a black candidate would be significantly less competitive. U.S. Rep. Bob Brady, chairman of the Democratic City Committee in Philadelphia, says that one hot rumor circulating in Harrisburg about his 1st Congressional District is way off the mark. Republican and Democratic sources in Harrisburg confirm that the rumor about Brady seeking a deal is swirling. One senior Democratic source put it this way: "Every House Democratic leader is extremely frustrated that you have the leader of the Philadelphia Democratic Party attempting to sell out a Democratic seat just to help himself." John Micek, Capitolwire reports on U.S.Rep. Bob Brady’s efforts to get the state’s current congressional redistricting plan passed. The report says Brady got State Sen. Tina Tartaglione to cast a key vote to get the new map out of committee, and that the congressman is now trying to drum up support for the plan among Philly’s state House delegation. Did the Democratic Party Chair push for something so contrary to the interests of his party just to insure that he had a district with more white voters? Most political folks I know think Brady could have been beaten by a well-known, well-funded black challenger in the old district with 48.0% black voters. It will be significantly more difficult with 35.5% black voters. Brady now has a district which will make it a lot harder for an African-American challenger for the foreseeable future, as the new boundaries are good for 10 years. Could a shift in the racial demographics this dramatic (compared to other districts) be in violation of the voting rights act? The demographic shift in the first congressional district certainly decreases the likelihood of another African-American congressional representative in Pennsylvania. Although more voters are crossing racial and ethnic lines in voting—particularly in high profile races like the presidency and governorships—voters are much more likely to vote for someone who looks like them in down ballot races. I expected that the Republicans would use their control of the redistricting process to gerrymander their way to increased representation. I did not expect the Chair of the Philadelphia Democratic Party to work with Republicans to guarantee himself a district which would be less competitive for an African-American challenger. Of course, given that redistricting is not an open, transparent process, we well never know for certain if this was the case. There is no smoking gun. But there sure is evidence pointing in that direction. Nostalgia for the Light: worth all the money I’ve wasted on a largely unused Netflix subscription. I thought when I retired I would actually use my netflix subscription instead of wasting money every month on a video rental service I never used. Well, it hasn’t quite worked out that way. A netflix film can still be around the house for weeks before I get around to it and the little Roku box I bought for streaming video has been used exactly once. Most nights I would just rather read. But there are some things film can do that a book cannot and thanks to Netflix I have seen some amazing films from around the world. 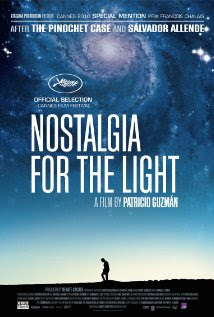 A visually breathtaking and deeply moving film I stumbled on last week was Patricio Guzman’s Nostalgia for the Light. I’ve watched all of Guzman’s documentary films about Chile. I was inChile in 1972, a year before the brutal coup which destroyed Salvador Allende’s non-violent democratic revolution. Chile has had a hold on my imagination ever since— although my return trip in 2006 was something of a disappointment. Guzman is still haunted by the horrors of Pinochet’s dictatorship. Set in the Atacama Desert where the dry air creates ideal conditions for astronomers, the film works on 2 tracks —the astronomers who describe themselves as archaeologists searching for the past in distant galaxies and the mothers of Pinochet’s victims also searching for the past in the Atacama, site of one of Pinochet’s concentration camps. The women wander the desert with shovels searching for the remains of their children. One says she wishes the gigantic telescopes looming in the desert landscape could also look deep into the earth and find her son. The two strands merge in a young woman whose parents were killed by Pinochet and who now studies astronomy. She finds consolation in the stars; although her sorrow is not diminished, there is a measure of peace in seeing her personal tragedy in a larger perspective. The shots of distance galaxies were astonishing and for the first time in my life, I thought maybe I would like one of those flat screen TV’s. (Rick and I are the only people we know who have yet to succumb to the lure of a giant flat screen TV.) Nostalgia for the Light was worth all the money I’ve wasted on a largely unused Netflix subscription. 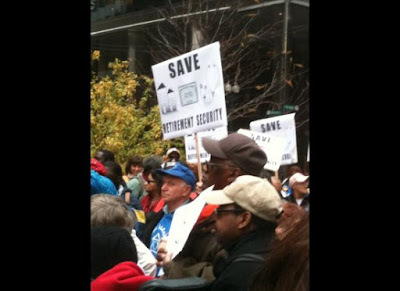 Social Security Disability Benefits:No subsitute for Medicare! "I have seen so many teachers, social workers and nurses who are exhausted by the emotional demands of their jobs..." Count me among these. I loved my private psychotherapy practice, but there came a time when arthritis made long hours in the chair impossible and the long, slow accumulation of residue from years of vicariously experienced traumas had begun to declare itself. When I retired, it was time. I was turning 60 in a job most folks would say you could do into your eighties. When I think of returning to it, I feel sick. Everyone I've ever talked to who is past sixty has begun struggling with notable physical decline in some form and longs for the day they can change gears to meet their own physical needs. I loved the column, but you should have mentioned that in our post-60's, health problems like diabetes, Parkinson's, cancer, heart disease, etc. tend to kick in, so not only will older people working make it less likely for younger ones to get jobs -- but also it is inhumane for a society to expect people to continue working when they may be frail or battling serious illnesses. The advocates of raising the eligibility age for Social Security and Medicare usually counter that those older folks who are disabled can apply for Social Security Disability Benefits. I asked a couple of my friends who worked for organizations advocating for the elderly and they both said, “It’s not so easy.” Unlike Medicare, which we are automatically entitled to at age 65, and Social Security retirement benefits, for which we are automatically eligible (at a reduced rate, to be sure) at age 62, there is nothing automatic about Social Security disability benefits. To qualify, applicants must be severely disabled, and even then there is a very high rate of rejection; getting approval takes forever. The arthritis Nance described would not be sufficient to qualify. About 60 percent of cases are initially rejected. Applicants can ask for review by an administrative law judge, hire an attorney and wait months for a hearing… By last fall, 840,000 initial applications were pending. Part of the problem is the sour economy. Applications have soared since late 2007 as workers with disabilities lost jobs and couldn't find new employment. At the same time, more boomers — many of them unable to find jobs — have applied for disability benefits. All told, about 8.5 million workers and about 2 million adult children, widows and widowers were receiving disability benefits as of August. The average age of a disabled worker in the program now is 53. No one gets rich from the program: The average monthly benefit is $1,070.20. Social Security Disability can not be counted on as a fallback for the infirm elderly if the eligibility age for Medicare and Social Security are raised. The idea that people who are not doing heavy physical work should be able to work well into their late 60’s and 70’s is cruel for all the reasons Nance stated. We can’t let this happen. It almost seems as if there’s a conspiracy to normalize the idea of working longer. Every time I pick up a newspaper, there’s another article about how we all have to work until we drop. Rather than dwelling on the familiar argument we just can’t afford to fund Social Security and Medicare, Edward Glaeser in his recent New York Times article,“Goodbye, Golden Years” puts a happy face on working well into old age. If the economy needed only a lump of labor, the spectacular expansion of America’s female work force would have led to vast male unemployment. But it didn’t. In fact, the number of working women rose by 87 percent in the 25 years between 1975 and 2000, during which time total male employment also increased, by 41 percent. However, the entry of women into the labor force occurred during a time of economic expansion (Yes, we had a recession in the early 80’s, but the 90’s were fueled by the dotcom boom.) Times are very different now as we remain mired in deep recession with increasing numbers of jobs out sourced to low-wage economies. …by at least one measure, the elderly are often the most entrepreneurial Americans. Self-employment rises significantly with age. West Palm Beach, a retiree haven, has the highest self-employment rate of any metropolitan area in the nation… Self-employment is particularly natural for older Americans, because it provides so much more control over working hours and conditions. …Gradually, our image of 70-year-olds needs to change from Florida retirees to Florida entrepreneurs, who find ways to make a bit of cash doing something a bit more fun than their former work. Security checks and increased Medicare costs. The effects of pervasive joblessness—on family, politics, society—take time to incubate, and they show themselves only slowly. But ultimately, they leave deep marks that endure long after boom times have returned. …If it persists much longer, this era of high joblessness will likely change the life course and character of a generation of young adults—and quite possibly those of the children behind them as well. We need to spread the jobs around. Our society has been pushing workers to stay in the paid work force by gradually raising the age at which they are eligible for full retirement benefits and now policy makers are proposing raising the eligibility age for Medicare But either we pay more in Social Security and Medicare by encouraging older workers to leave the workforce or we’ll be paying more in unemployment compensation--not to mention the range of social ills resulting from a generation of young people who can’t find steady employment. Of course, seniors who love their jobs and want to continue working should do so. But most do not, and it’s not just those with physically demanding jobs who long to retire. I have seen so many teachers, social workers and nurses who are exhausted by the emotional demands of their jobs but are hanging on for fear that there will be steep cuts in Social Security and Medicare. A social contract across the generations is sometimes discussed in terms of fewer entitlements for the old and more for the young. A better way to think about this is sharing what has become an increasingly scarce resource—a job and all that means for family and community stability. 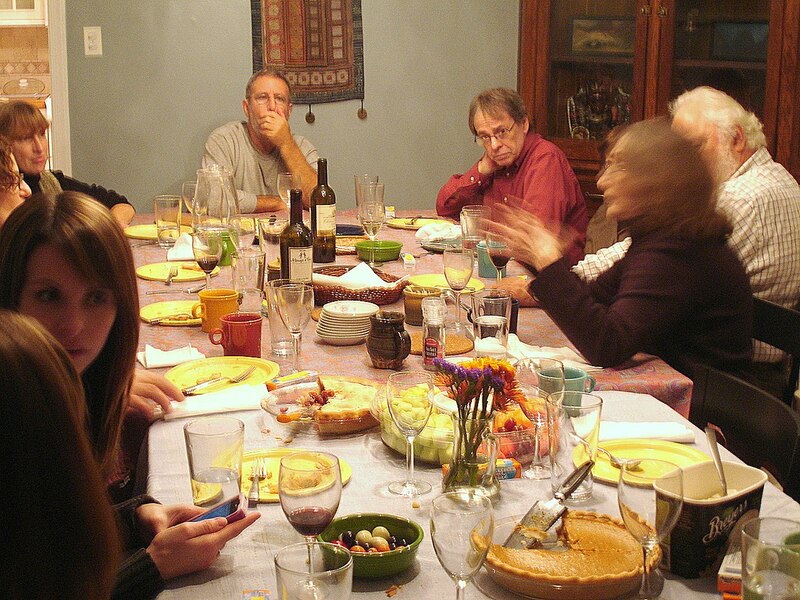 I still haven’t quite gotten used to being the older generation at my family/friends, multigenerational Thanksgiving dinner. I still haven’t quite gotten used to being the older generation at my family/friends, multigenerational Thanksgiving dinner. In some ways, Thanksgiving is a lot easier now. Rick and I used to drive to Rhode Island every year to spend Thanksgiving with Rick’s relatives. Rick and I for so many years were the middle generation. His parents are deceased and we now we spend Thanksgiving with my sister, her friends and their children; now we just drive to the Philadelphia suburbs. My husband and I were the oldest people sitting around the table; next my sister, her husband and friends in their early 60’s: then the generation ranging from late 20’s to early 40’s and at last the next generation— beautiful 4 month old Evan. My son Cris who has never been able to shake off the old holiday habits from those joint custody days of his childhood has two Thanksgiving dinners—one with his father’s family and one with us. One of the really bizarre aspects of getting older is the way our sense of self lags so far behind our chronological age. When my brother-in- law kindly announced our arrival with “Here come the old people,” my initial reaction was, “Who me?” But as Rick says, “Get used to it.” At least we’re still here, and we have each other, and some wonderful folks to spend Thanksgiving with. I thought the Bar Association could be counted on to insure a judicial candidate met minimum qualifications, but apparently not. I’ve never been a fan of electing judges, and sure don’t want Bob Brady deciding who gets to be a judge. However, I thought that at least we have the Bar Association to certify that the candidate has the minimum qualifications for the office. I had also assumed that the Bar Association could be counted on to certify that the candidate was of good character (at least no major scandals or ethics violations). I was wrong. Just in case you missed it, a very troubling article about Judge Nocella appeared in at Monday’s Inquirer. Newly elected Common Pleas Court Judge Thomas M. Nocella credits U.S. Rep. Bob Brady - Philadelphia's Democratic Party boss - for intervening with ward leaders to put him on the ticket. "He is the one in control," said Nocella, 67, rated qualified for the bench by the Philadelphia Bar Association, despite having been sanctioned by the city Ethics Commission in 2009. He pointed out that he had done years of free legal work for the party and said the judgeship was his reward. "That's the way it's done in Pennsylvania," he said. On Jan. 2, he will begin drawing a $165,000 judicial salary. Nocella welcomes the new income because there is a $358,000 IRS lien against him, the state says he ignored local taxes for years, and he has more than $1 million in debts listed in a bankruptcy case. He is also embroiled in a Common Pleas Court lawsuit accusing him of fraud and deceit in 2005, when he helped sell off property for $507,500 that was owned by a Veterans of Foreign Wars post in Manayunk. Nocella was totally unapologetic about getting a judgeship as his reward for doing free legal work for the Party. No wonder so many young people today want nothing to do with electoral politics. According to Nocella, “No one on the [Bar Association] panel asked him about the VFW lawsuit or about fines that he was forced to pay by the city Ethics Commission two years ago.” Were they asleep at the switch or did they just not care? 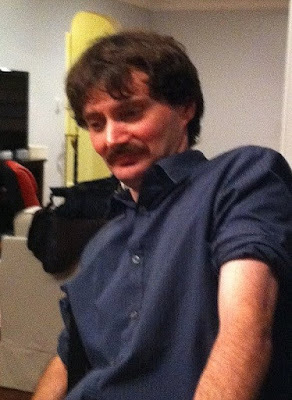 Nocella lost three primary elections, but despite these repeated rejections by the voters, Brady chose him to fill a last minute vacancy, thus making a total mockery of the democratic process. I urge you to read the entire article and let Rudolph Garcia, the chancellor of the American Bar Association know what you think of his organization’s decision in this case. Americans for Democratic Action and the Philadelphia Chapter of the National Organization for Women have written letters of protest and I expect other progressive organizations will as well. What will it take to get citizens angry enough to demand change in the way we choose judges?? 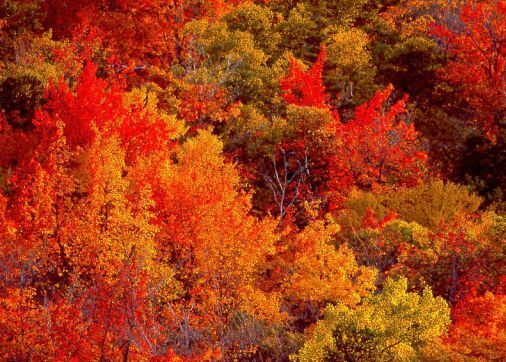 Fall was later than usual in the Delaware Valley this year. 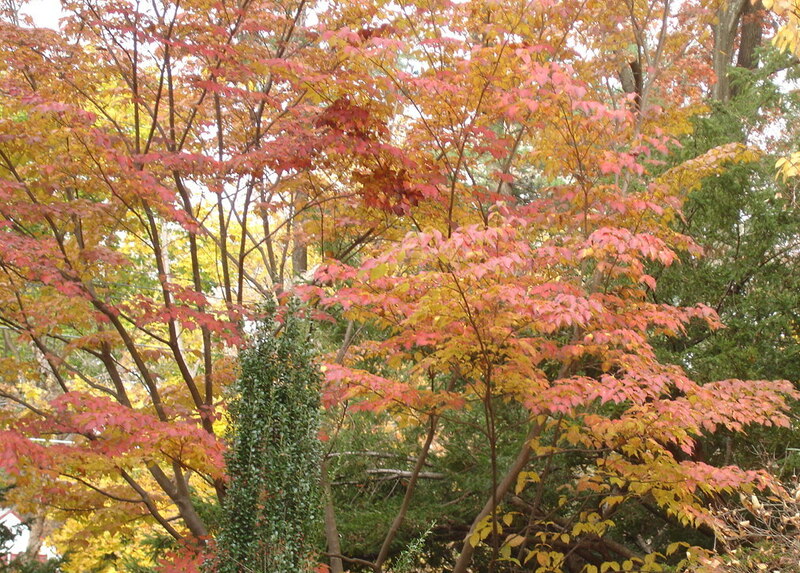 I was complaining about this in mid October, but now I’m really enjoying all the fall foliage remaining in November. I can’t remember a year when there was still so much color in November. Maybe it's my imagination but the reds seem more brilliant this year. 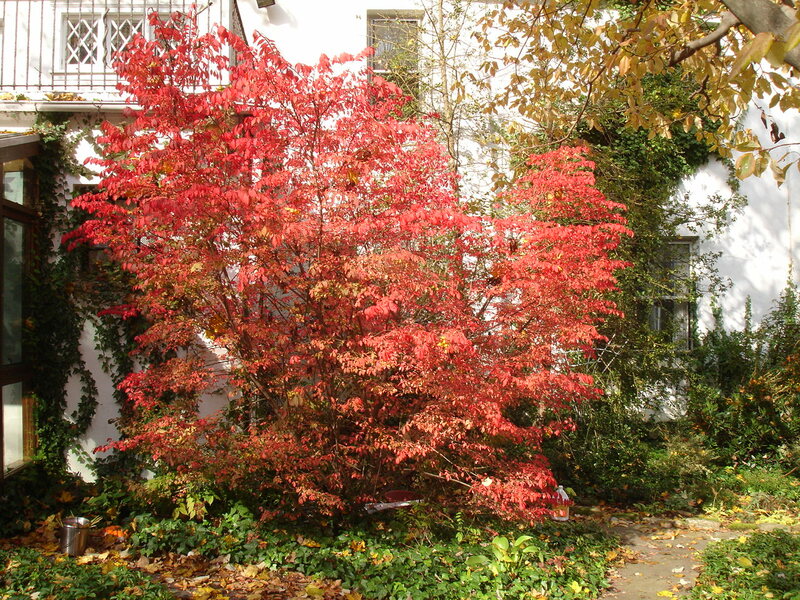 My euonymus which most of the year is a scraggly, non-descript shrub has come into its scarlet glory. 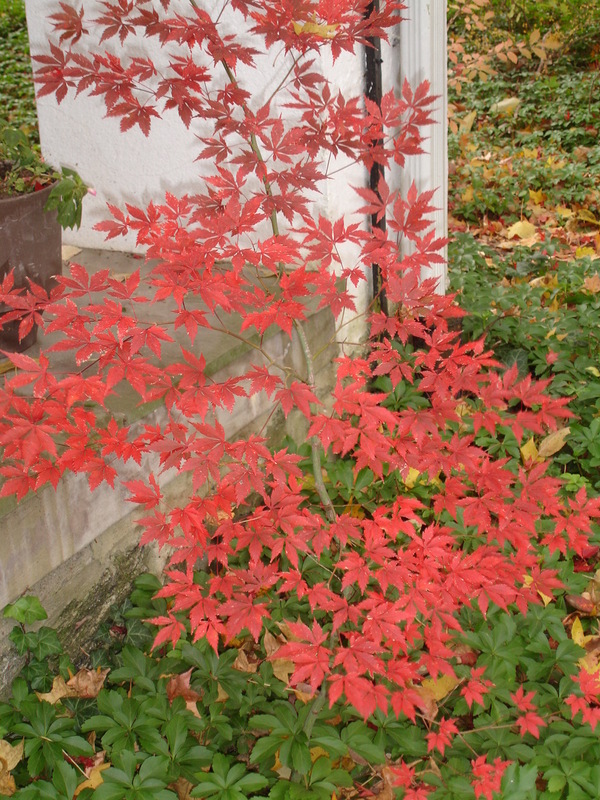 A little volunteer Japanese maple has sprung up in the wrong place, but it’s so beautiful I can’t bear to uproot it. 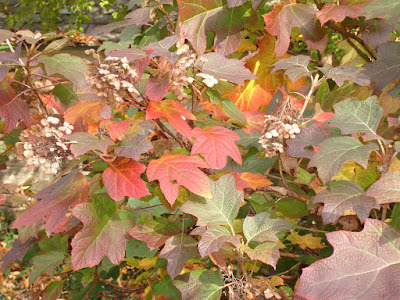 And some of my beloved shrubs are just starting to turn! 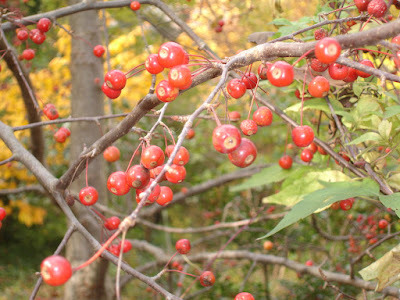 My flowers are mostly all gone, but I have the consolation of berries. 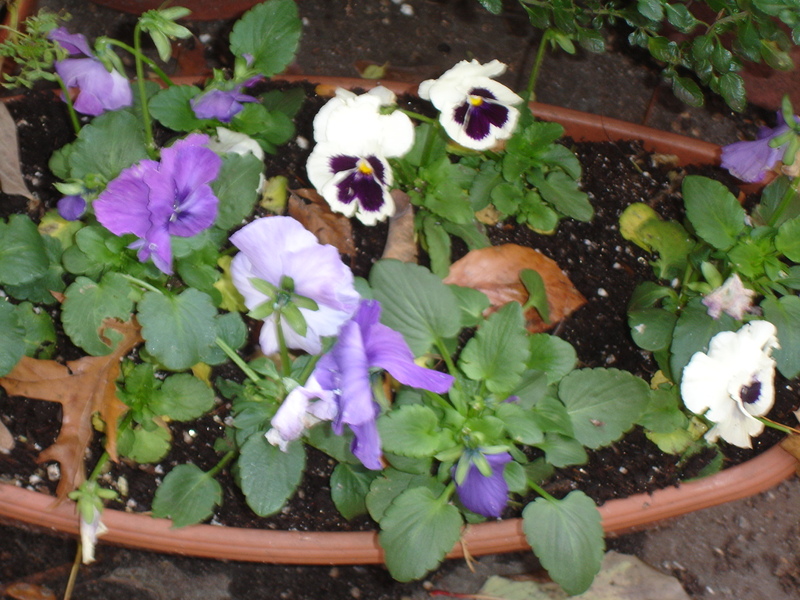 And then there re those tough little pansies which can survive a killing frost and sometimes make it through the winter! There was something weirdly familiar about his look of wonder and then it hit me. That was just how my crazy hippie friends and I would talk about our acid trips, marveling at the magical world of intense colors LSD and mescaline opened up for us. My trips were a little less intense than most; I was a cautious "just a ¼ tab” person. I really didn’t like my brain playing tricks on me and with my small dose I got the heightened perception without the bizarre delusions. Kind of like Rick’s cataract operation! Many powerful and successful women and men in our society experimented with drugs in their youth. But their careers were not derailed; their families were not torn apart. Sadly, they are now willing to ignore the fact that another generation of women and men are being incarcerated in appalling numbers for drug-related crimes. I can look back nostalgically at my (few) acid trips while right now there’s somebody rotting in jail for having had the misfortune to take drugs in a much less permissive time. My plants are getting too big for my house! Each year when I try to cram my plants back into the house, it gets harder and harder. This year with our abundant rainfall, the plants have become enormous and the challenge of getting them back in is greater than ever! 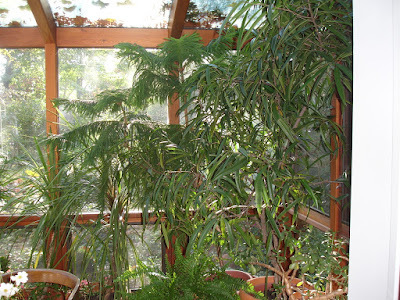 We are now at the point where only 2—-at the most 3--people can fit into our little sun room when the plants are back. I love my plants and am very happy they had a good summer BUT this is becoming a bit problematic. And as always I am desperately trying to get them back in the house before a frost. I thought that when I was retired there would be no scrambling in November to get plants in before the first frost. Unfortunately, it hasn't worked out that way and I am as behind schedule as I was during my working years! I am so tired of left wing critiques of Obama that refuse to credit his achievements or acknowledge the constraints he has been under. His achievements, extremist criticism to the contrary notwithstanding, have been impressive. Although now reviled by both the left and the right, the stimulus program, according to most economists, brought the economy back from the brink of real disaster. Yes, it should have been larger, but was arguably the best that could be done, given this dysfunctional Congress. Remember what a difficult time the President had getting three Republican votes in the Senate to pass the bill. Despite implacable Republican opposition, President Obama, with a lot of help from Nancy Pelosi, still managed to pass a healthcare bill establishing access to heath care as a right of all citizens. Sure, it’s an imperfect bill, but once the economy revives, we will have the opportunity to improve it, just as we have had with other deeply flawed programs, such as Social Security. Just as Social Security, which excluded the majority of share croppers and domestic workers and thus effectively excluded the majority of African-Americans, was amended, this bill excluding undocumented workers and suffering from a number of other faults, can eventually be fixed. Another accomplishment is the passage of meaningful—again not as much as we needed—regulatory reform. The dismantling of regulatory agencies at the root of the current economic crisis dates back to the Clinton years. This crisis was many years in the making and we in all probability have a long ways to go before real recovery. Reasonable people understand this. 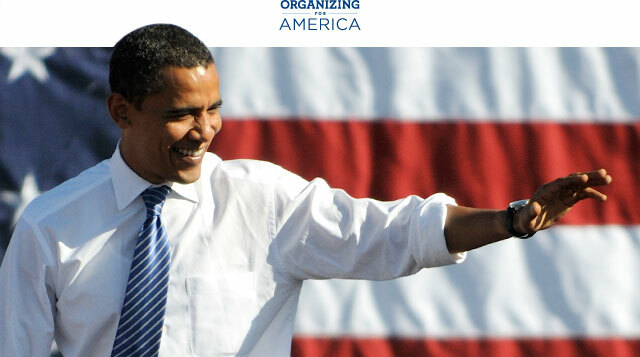 Some of Obama’s achievements have gotten relatively little media coverage, and many voters have forgotten them. His overhaul of the college loan program resulted in significant savings for students, their families and the taxpayers, but has received little credit. Similarly, the rescue of the auto industry has earned the President nothing like the credit he deserves. And let’s not forget that Sonia Sotomayor and Elena Kagan are on the Supreme Court: their nomination is a testament to Obama’s good judgment; their senate confirmation a testament to his political skill. Finally, consider Obama’s foreign policy achievements: He rid the world of Osama and finally brought the country some degree of closure after 9/11. Somewhat too slowly from my point of view, he is winding down the two wars he inherited. His policy in Libya, criticized as both too aggressive and too tepid, appears to have worked with the end of the Gaddafi regime. For anyone who reads the foreign press, there is no doubt that Obama has dramatically improved the image of the US around the world. Many critics on the left make unfavorable comparisons between Obama and FDR-- ignoring real differences in historical context. FDR had a Democratic congress; Obama had one in name only—the Blue Dogs may have been Democrats but they were hardly supportive of Obama’s programs. In addition, globalization has changed the game; it’s much harder now for governments to have an impact on their national economies. Obama’s opposition is much stronger than Roosevelt’s was; for example, he is facing a capital strike right now, with corporate interests sitting on mounds of cash they refuse to invest. Is it because of uncertainty, as they claim, or are they are waiting for a Republican President and what they see as a more favorable investment climate? There are far more constraints on Obama than there ever were on FDR. I can understand frustration that Obama has not used the bully pulpit as effectively as FDR (who has? ), but let's be fair about what he’s dealing with and give credit where it’s due. When I started this blog several years ago, I intended it to focus on retirement issues. 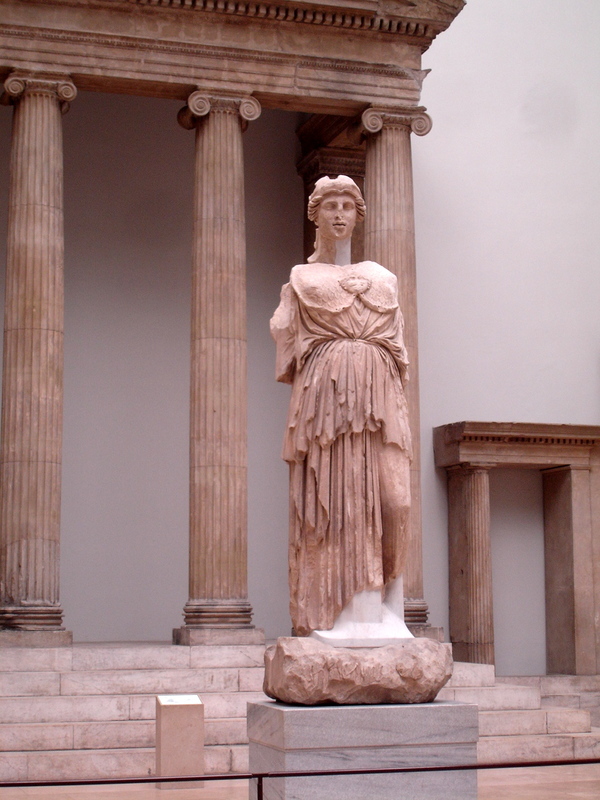 However I’ve written 40 posts on politics, 26 on feminism for a total of 66 political(in the broad sense)themes and only 33 on retirement life. I guess this is no surprise as one of the reasons I retired was to have more time for political activism. I had intended to take a break from political blogging but could not resist responding to a post on the Philadelphia Democratic Progressive Caucus list serve. I think it's outrageous that the party is, as I understand it, asking for $10,000 per judge," Garcia said. "I don't see why printing costs for sample ballots should be anywhere near that amount. This is one of the things wrong with our system, and why we shouldn't be electing judges the way we do. Also working to reform the Democratic Party does not preclude dealing with broader social justice issues. This is not an either /or. Those uncomfortable with reform often make the argument that this is too small to be concerned about; there are bigger fish to fry. But there will never be a time when undemocratic practices in the Democratic Party are the only item on the progressive agenda. I was surprised to read Marc’s warning: “I hope you keep in mind that killing a dying machine without thinking realistically about what we are going to put in its place is a recipe for disaster.” I don’t think our still relatively small group is in a position to “kill” the machine and cause a “disaster." The machine is slowly dying by a thousand cuts. The Progressive Caucus is trying to build the progressive wing of the Democratic Party. We are trying to develop a strategy for 2014, when committeepeople and ward leaders will be elected. Previous efforts in the past decade have faltered because we started too late. We are now starting years in advance and also working to ensure that abuses like the Tracey Gordon case will not occur again. How can we hope to recruit energetic progressives if we cannot assure them that if they win election they will be seated? And of course campaign finance reform ( not so easy I know) has got to be part of the long-term strategy. I expected that there would be progressives-- especially elected officials, would-be elected officials, ward leaders—who would not be favorably disposed towards a progressive caucus. When they’re with progressives they emphasize their progressive policy positions; when they’re with the party machine types, their inner ward leader comes out. I’ve seen a few elected officials do this little dance for years. They are usually good people with genuinely progressive instincts, but for increasing numbers of grassroots activists, this is not enough. We don’t want leaders who take progressive policy positions, but ignore(and sometimes defend/participate in ) undemocratic practices. We are not going to attract talented committed folks, especially talented committed young folks without cleaning up the process. Also, Marc states: “For all its flaws, we do a better job of turning out working class people in this city than in most other similar cities. How, with a weakened party, are we going to keep doing that? No city in America has found a better solution than something like a traditional party machine.” I would like to see those statistics that the Phila. Democratic Party does a better job of turning outworking class voters than Party machines in comparable cities. The numbers I’ve seen on the Phila.gov website are really depressing. Anyway, I sure don’t have the answer to the political mobilization problems we’re facing. That’s why the Progressive Caucus was formed-–to encourage more progressives to work within the Democratic Party to make the party more transparent, more “small-d” democratic, and by doing so to make the party more attractive( especially to young people) and thus increase participation. There is a reason why the Democrats struggle to win elections in a majority-Democratic State. It is because of corruption and hack politics. There's a reason the Philadelphia Democratic Party gets away with shaking down judicial candidates; it’s time to start connecting the dots. The city's Democratic Party organization invited 27 Philadelphia judges to a buffet breakfast this week and asked them to pay $10,000 each to assure party support when they face yes-or-no retention votes in November, according to judges who attended. The figure is double what the party asked from sitting judges two years ago. And the request was reportedly delivered with a warning from the party treasurer, former State Rep. Frank Oliver, that Democratic ward leaders would "cut" - withhold support from - judges who failed to pay, according to several witnesses. Democratic Party Chair Bob Brady, who has a real talent for plausible deniability, left the room when the party treasurer made his pitch. I don't know what was said at the meeting, because I wasn't there," Brady said Thursday. …. The Democratic Party, for the 25 years I've been there, has never endorsed or unendorsed anybody for monetary reasons. . . . A good-faith effort, that's what the party asks." Of course nobody believes this. A Daily News editorial asks: "Dem Party courtship of judicial candidates a stickup?" Anyone who pays attention to judicial elections in Philadelphia knows the process is riddled with corruption. But our local press doesn’t connect the dots. You can run this kind of judicial shakedown operation only if you are confident that enough committeepeople and ward leaders will go along. Tracey Gordon did not intend to be a docile committeeperson who was there just to take orders. She was unhappy about the lack of voter participation in her neighborhood and ran to increase turn-out in her division. This may not be what some ward leaders want. But energetic committeepeople who want to educate voters and increase voter participation are just what we need. We’ll never clean up Philadelphia’s political mess until more civic-minded people run for these slots. And how many of these folks will choose to run if they know that the ward leaders are allowed to ignore the will of the voters and to refuse to seat duly elected committeepeople they may not be able to control? If we had more independent committee committeepeople and ward leaders, the kind of judicial shake-down operation reported by the Inquirer and Daily News would be a whole lot harder to pull-off. This week someone broke into my home and stole my laptop. I was upstairs at the time and had stupidly left the back door open. I’ve been careless about this for many years and have been lucky. We’ve only had one robbery in the past 20 years—-someone broke into our garage and stole a power mower. Breaking into your garage is real different from having somebody break into your home. The sense of violation is hard to shake and especially so when you’ve come face to face with the robbers. 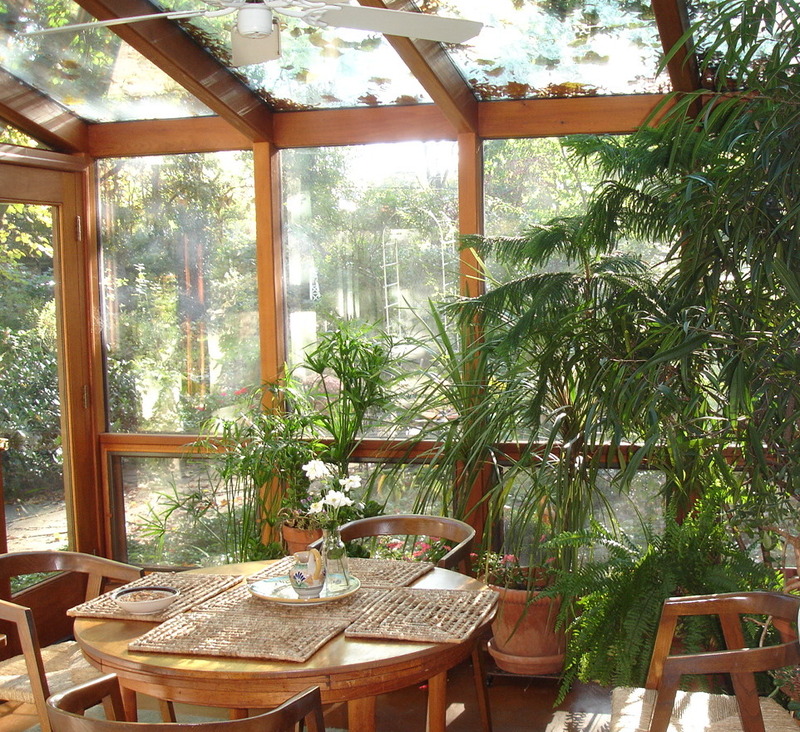 I went downstairs and into our small sunroom which opens into our back yard and found the door wide open. Then I noticed the missing laptop and the disconnected phone. I locked the door to the sunroom, went back to the kitchen to get a functioning phone and then walked back to the sunroom and saw 3 teenagers at my back door. Obviously they had come back for more, no doubt hoping the door would still be open. I screamed and they ran away. But the image of the three of them ready to break in is something I can’t shake. I really wish I hadn’t seen their faces. I think 20 years ago, maybe even 10 years ago I’d have had an easier time putting it in perspective. I’d tell myself—it was just a lap top. I wasn’t beaten up, they didn’t get my pocket book with all my credit cards, they didn’t go on a rampage and destroy the house. I would have taken more precautions and eventually forgotten about it. But now that I’m in my 60’s I’m feeling more vulnerable. I spend a lot of time working in my garden and have never worried about personal safety, but then at this stage in my life I can’t run all that fast and I am certainly in no shape to fend off any teenage attackers. My garden is my refuge and now I’m not so sure I want to be out there when my husband is not home. And the days of going out in the garden and leaving the back door open are over. And then there is the issue of fear of young back men. I don’t like that feeling and I know of course that the vast majority of young black men are not criminals. But as I live in a majority black neighborhood, the young men who break into my house are most likely to be black. If I lived in neighborhood adjacent to a poor white neighborhood my fears of young men wouldn’t be so focused on young black men. Since our neighborhood is just not rich enough to attract sophisticated career burglars, the people likely to break into my house will be teenagers and probably black teenagers. I want to resist looking at any young black man who comes to my front door with suspicion. When I was younger, I had a much easier time resisting those stereotypes. Now that I’m old and more vulnerable, that suspicious response is harder to resist. This feeling is just as unsettling as the sense of violation. I really wish I hadn’t seen their faces. So if Junín represents a partial and maybe temporary victory, Yunguilla is a success story, albeit of a different kind. A small community of about 50 campesino families, nestled in the mountains north of Quito, Yunguilla used to support itself by raising cattle, farming and cutting down trees to make charcoal. In 1995, a small group of 15 families (the 15 crazies, as they became known), suggested they try to find a more sustainable way to make a living. People were doing fine, and so there was initially a lot of resistance to change. But gradually new enterprises were introduced. In 1996, a group of 18 women, mostly wives of the crazies, began producing jam, using organically grown fruit, grown on site. Later a cheese making process was added. We saw both enterprises, which are small scale, each in a room no more than 15 feet square. The community is also running a large nursery aimed at reforesting the areas with native trees and plants. Finally, in 1998 the United Nations sponsored their first ecotourism project. Their facilities were quite attractive, but we didn't stay overnight, so I can't speak to the details. Germán Collaguazo, the leader who spoke to us, said one of the biggest obstacles they had to overcome was people's feelings of inferiority or incompetence, as mestizo campesinos--an attitude some of us would call internalized racism. But eventually, 38 of the families came around, the remaining 12 being mostly elders. Only three or four families chose not to participate. Most interesting was how the governance of the community changed. Initially they created the Yunguilla Corporation, but soon decided that this capitalist model wasn't adapted to their highly participatory community. So they created their own development model, which stated that the company is community-owned, and that work teams would be created with different responsibilities. There is no one leader; they feel it is more important to keep creating new leaders. Governance is done by a General Assembly with decision-making power. The teams implement the decisions. Germán said that self-esteem and solidarity have gradually increased, though it is hard to maintain a high level of participation among all the families, because people are very busy. But many youth are taking leadership roles, which gives hope for the future. over the 17 years that Texaco operated...the pipeline suffered 27 major breaks and spilled nearly 17 million gallons of oil, much of which was not cleaned up....For comparison, the Exxon Valdez spilled 11 million gallons. More to the point, over the first quarter-century of its life...the 800 mile Alaskan pipline spilled only 1,675,000 gallons--almost all of which was cleaned up. The "remediated" pits are a big problem. When it rains, the oil bubbles up to the surface and continues to cause health problems and foul odors. In my small knowledge of environmental remediation, the term usually means carting away all toxic material to some burial site and replacing it with clean soil and/or water. Not sprinkling soil on top, like powdered sugar on a cake. Oh, did I forget to mention--this whole area was populated while the drilling went on. The polluted waterways were the drinking water, fishing grounds and laundromat for many indigenous communities. As you might expect, health problems have skyrocketed in this population: there are high rates of cancer, abortion, and skin and respiratory problems. All in all, 30,000 people were affected. We went to one remediated site, with the old closed off well head still on it, as well as the house of Mercedes Jimenez. It is a small, apparently 1-room house, with no glass in the windows. Fortunately, the porch has been fitted with a large 2-tank water purification system, so the family doesn't need to drink polluted water. In the picture, you can see our group in front of the house, and a guide has just dug up a blob of gooey black stuff, from less than two feet under the surface. So what has been done? A coalition of indigenous groups has been fighting in the courts for 18 years. First they sued Texaco in the US, but a judge ruled that American courts didn't have jurisdiction over the case. So they sued in Ecuador. 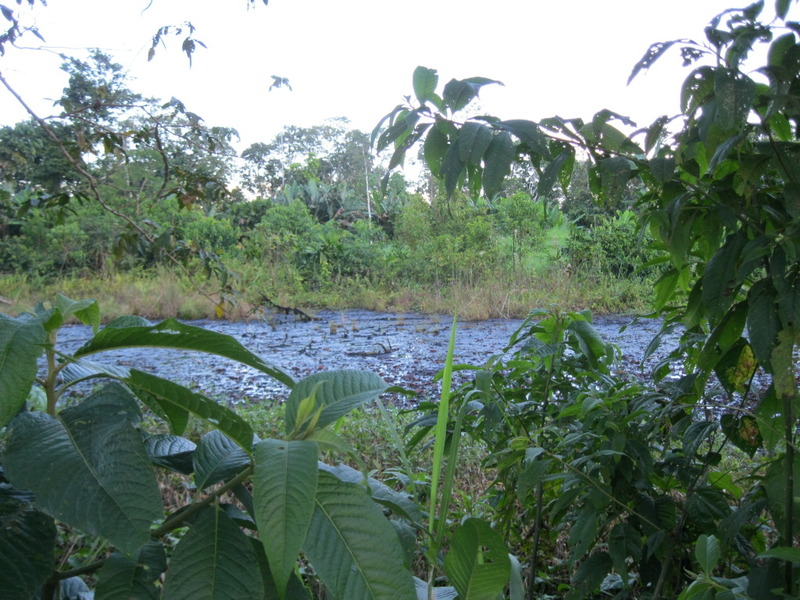 The case became complicated, as Chevron since bought up Texaco, and drilling has continued to this day under Petroecuador (though with better environmental controls in the latter case). It has been a very long struggle, during which the next generation of Amazonians were aborted, born with birth defects, or subject to their own illnesses as adults. We saw a documentary, which included an interview with a middle aged woman and her daughter, both of whom have cancer. The daughter was diagnosed shortly after getting married, and subsequently had a miscarriage. Finally this past February, an Ecuadorian court in Quito ruled in favor of the indigenous groups, and required Texaco (now Chevron) to pay approximately 8 billion dollars for reparations. Chevron has sworn it will not cough up a penny (they've already done remediation!) and has appealed. If history is a predictor, they never will. The plaintiffs have also appealed, saying the amount is not enough. And so it goes on. If you follow environmental injustice around the world, you will know that there are few victories against corporations. Shell Oil, for example, managed to pollute the Niger Delta and force an entire ethnic group, the Ogoni people, from their homeland. Like the Amazonians, they lived from the land and water, making their living primarily form fishing. Post oil pollution, this was no longer possible. To my knowledge, there have been no consequences for the company, though indigenous leaders have been persecuted for fighting back. I read in the paper in late July that the Republo-fascists have reported a bill out of committee aimed at emasculating the EPA. So as corporations gain further ascendancy here, we can expect some of these environmental disasters at home. It's time to get together people! In was entirely appropriate that we visited the tiny village of Junín on the 4th of July. Junín is located in the Intag River Valley, a lush cloud forest northwest of Quito, which is home to one of the world's most bio-diverse protected areas, the Cotacachi-Cayapas Ecological Reserve. Unfortunately it is also home to a number of minerals, known since the 1990s, including copper, which was discovered by Mitsubishi. Ever since, various mining enterprises have sought and are seeking digging rights. Some towns in the valley have succumbed to the potential financial boost of mining, but not Junín. They saw the impacts of exploration from 1990 to 1996. Road building led to mud slides near their village; along the roads came trucks with machinery and chemicals which contaminated the Intag River. The river was used to dump sewage and garbage. Children began to show skin problems from contact with the river. Residents of Junín joined with neighboring communities to oppose mining. With help from national and international organizations they went to work. They obtained the Environmental Impact Study (EIS) done by Bishi Metal, a Mitsubishi subsidiary, which said that the mining would result in removal of at least 100 families and creation of a mining town of 5,000 people, 10 times larger than the largest villages in Intag. In addition, the environment would suffer massive deforestation leading to desertification, contamination of water sources with lead and other heavy metals, and loss of dozens of mammals and bird species, as well as damage to the adjacent Ecological Reserve. Some residents visited a copper mining area in Chile, and indeed what they saw was desert--nothing else. The corrupt local government not only didn't help them, but collaborated with the company to file legal cases against villagers for sabotage and terrorism. In response, the communities went in 1998 to the Interamerican Commission on Human Rights (of the OAS), saying their struggle was in defense of life and the environment. I have not been able to find out about the results of that case. In any event, calm prevailed until 2003, when the government gave rights to the same land to a Canadian copper mining company. The company began buying land all over the area, and also buying off local leaders, which successfully divided communities and families. Resistance increased, including building a gate to bar entrance to the area. The company sent paramilitaries from the Ecuadorian Army to harass the villagers. When the paramilitaries couldn't get into the community, they climbed high into the mountains. The opposition, unarmed, climbed after them in the night, and conducted a people's arrest. They detained the paramilitaries for 9 days, and invited in the international and national media. 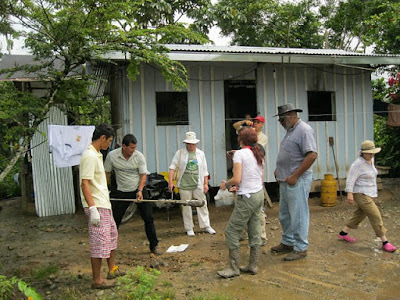 We saw a dramatic documentary of this incident, and were addressed by one of Junín's leaders, compañero Polivio Pérez. This did finally get the attention of the Ecuadorian government. It was a partial victory, as the concession is no longer located on their land. But the communities still have not healed from the divisions created, and there is no guarantee that mining will not continue all around the area. Our guides told us that while the current president Rafael Correa is extremely progressive, and trying to help the poor in all ways he can, pave the roads and build up infrastructure, he needs funding. The only way to procure all this funding, he feels, is to develop oil and mining all over the country. He has thus lost the support of the very large and strong indigenous movement. In the meantime, Junín is developing alternative sustainable projects, including production of shade-grown coffee, sugar, and ecotourism. We stayed at their lodge for a few days while we learned about their struggle and saw their enterprises. The lodge is very rustic and even primitive by tourist hotel standards. But it sufficed and was graced by the cooking, however basic, of compañeras in the struggle. But Junin is not out of danger. The Ecuadorian government is partnering with the Chilean company, Codelco, the largest copper mining company in the world. While Codelco denied it is planning to explore Junin, one of its executives recently proclaimed, “We are going to start the most systematic exploration in Ecuador.” Several international mining companies are exploring gold and marble mining in other parts of Intag. Some would say that the 4th of July represents a notable but now precarious victory for liberty in this United States, as we witness the takeover by corporations and their flunkies at all levels of government. That is why I say it was appropriate that we visited Junín on that day. When BlogHer Announced Dominique Browning's Slow Love as one of options for the BlogHer book club, I wondered if given all the suffering of the millions of unemployed Americans, I could muster any sympathy for a very affluent woman who had lost her dream job. I decided, with some apprehension, to give it a try and my answer is a qualified yes. Despite Brown’s class blinders, her engaging writing style drew me in. over me after the divorce by slowly bringing my house back to gracious, hospitable life. I have spent years basking in the beatitude of this home… . I can relate to this. I too am in love with my house. I’m 66, my husband is 70 and we both intend to stay here as long as we can. But I know that sooner or later, one way or another, I will leave the house I love. After my husband and son, there is nothing I love more than my house. It is certainly not prime real estate like Brown’s and I’m sure her garden was in better shape. (She was the editor of House and Garden after all) But my guess is my passion for my old house is as strong as hers. Many thanks to Stroller for reading this manuscript with care and concern, and taking the time to comb thorough the pages, pointing out distortion and delight alike. I sure hope for her sake this does not mean the relationship continues! quiet of solitary moments steal over my heart. On balance, I enjoyed the book but it was a demonstration of how those with economic privilege live in a class cocoon. They may be thoughtful engaging people, they may be good friends, and good parents etc., but writers like Brown can seem so oblivious to the pain outside their charmed circle. 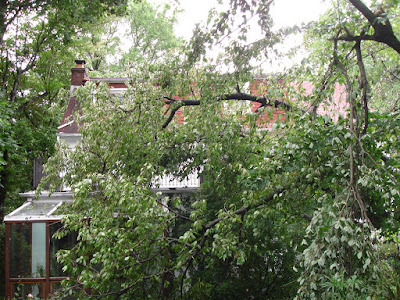 I am so tired of dealing with tree damage. 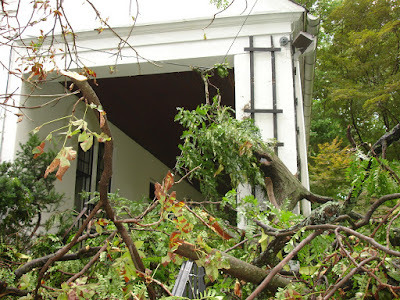 We lost a major chunk of a tree the week before Irene, with all the usual downed wires and loss of service problems. Now Irene has destroyed a beautiful very old—apparently very weak-- cherry tree. 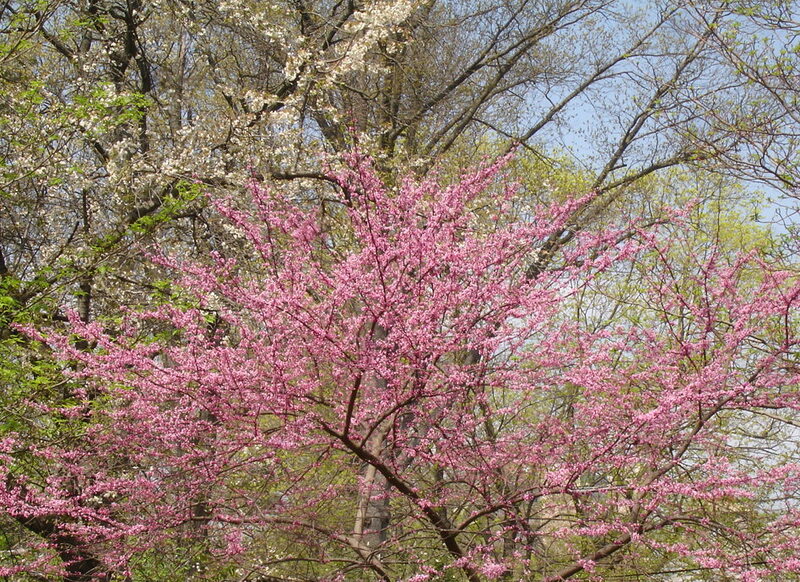 It bloomed the same time as a Redbud every April; the white cherry tree flowers intertwined with an adjacent Redbud were gorgeous. 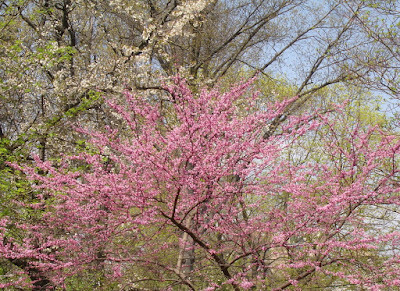 I looked forward to it every spring and it’s hard to accept that I’ll never see it again. I think of my trees as old friends and it's hard to part with them. I guess I should be happy that the tree didn’t cause major damage to the house. 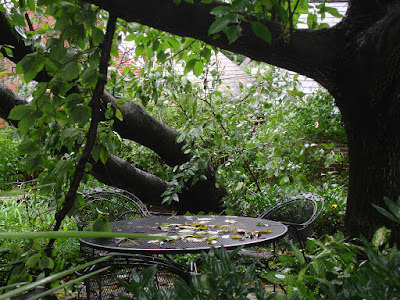 It fell on our little sunroom roof but didn't destroy it. We’ll need to do some plastering and repainting thanks to a big locust branch which fell on our front porch and I’m sure when all tree debris is removed we'll discover more damage. Right now we're dealing with downed wires all over the property, but amazingly at least so far, no loss of service. We can’t get our car out because of all the downed electric wires in the driveway and PECO has no idea when they can come out! At least, unlike FIOS, PECO eventually answers the phone. It’s getting harder to come up with a convincing answer to friends who ask me: “Why do you bother working within the Democratic Party? My answer: in the near future, working to build space for progressive politics within the Democratic Party is the only option. I still believe this, but recent events have really tested my commitment. Last summer many progressives Democrats learned that the Philadelphia Democratic Party had refused to seat duly elected committeeperson Tracey Gordon. This incident gave birth to the Philadelphia Democratic Progressive Caucus. Please see our website. and Facebook page. Party Chair Bob Brady refused to respond to the repeated attempts of Tracey Gordon and of the Philadelphia Democratic Progressive Caucus to resolve the issue. In response, Burn makes the preposterous claim that Tracey Gordon has not exhausted Philadelphia Democratic Party grievance procedures. In his reply to Jim Burn's letter posted at youngphillypolitics.com, once again Irv Acklesberg documents the repeated attempts to contact the Philadelphia Democratic Party re this matter. Irv’s letter notes that Dep. Executive Director Fadia Halma asked him to give Brady one more opportunity to address the grievance. Halma acknowledged receipt of Irv’s April 26 letter to Bob Brady. Brady ignored Irv’s letter, as he did with previous communications. Since almost four months have elapsed, Brady has had ample time to respond and as Irv states in the attached letter, the local exhaustion requirement has been met. Also, there is no process applicable to a challenge of a duly elected committeeperson, because such a challenge would be unconstitutional, as decided by the PA Supreme Court and the State Rules (which require county committees to have a contest procedure, except where the committeeperson was elected, presumably because the party can't allow such challenges). Irv further states in the attached letter that he will seek redress in court if this cannot be resolved internally. I would think that Burn would want to avoid the negative publicity which would ensue. I understand that Burn has a close relationship with Brady and that Brady was instrumental in Burn’s becoming Party Chair. However, this personal relationship should not stand in the way of the party’s honoring the results of a democratically conducted, decisively won election. When I do voter registration work, I encounter more and more young people of all backgrounds who want to register as Independents. It’s getting harder and harder to convince them (especially those who identify as progressives) that there is space for progressive politics in the Democratic Party. The Philadelphia Progressive Caucus hopes in 2014 to encourage significant numbers of progressives to run for county and for state committee. If we can’t guarantee that if they win election that they will be seated, how will we ever convince them that Democratic Party is worth their time and energy? 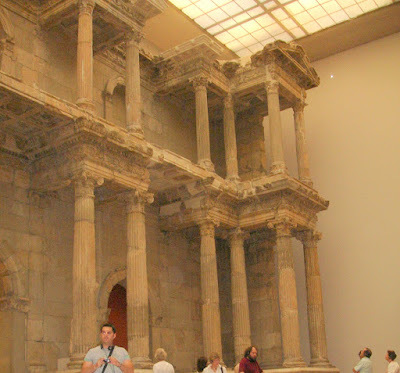 The 2nd century BC Pergamon Altar with its astonishing frieze depicting the battle between the Gods and Giants generally regarded as a masterpiece of Hellenistic art. 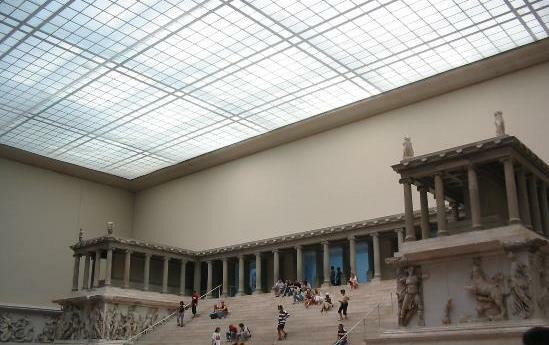 To see everything in the Pergamon alone would have taken at least 3 days. I was determined to squeeze in the Egyptian collection in the in Neues Museum to see the bust of Queen Nefertiti. It’s fascinating to actually see these iconic images rather than the photographic reproductions. There’s usually some unexpected difference. I remember how stunned I was when first saw Stonehenge—it seemed so small, nothing like the enormous monument I had imagined. 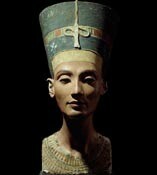 There was a difference with the bust of Nefertiti. That penetrating, far-away gaze of “the beautiful one” (as her name is said to mean) was far more powerful than any of the photographic reproductions conveyed. 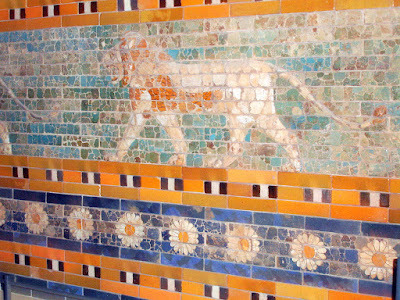 By some miracle the original color is preserved without restoration. In addition to the Pergamon, the crown jewel of Berlin Museums is the Gemäldegalerie der Staatlichen Museen zu BerlinThe Gemäldegalerie has an astonishing collection of 13th -18th c European art. And the museum was uncrowded! Most of the package tours which stop in Berlin for a few days go to the Pergamon( which was crowded) and take a pass on the Gemäldegalerie. A major mistake. We almost overlooked the Neue Nationalgalerie. Rick is a real Mies van der Rohe fan and he wanted to see the building which he designed. Since we were already at the museum—-one of the best designed museums I’ve ever seen—-we decided to see what we could of the collection. And what an astonishing collection of German art from 1900-1945—Feiniger, Beckman Grosz, Nolde etc. 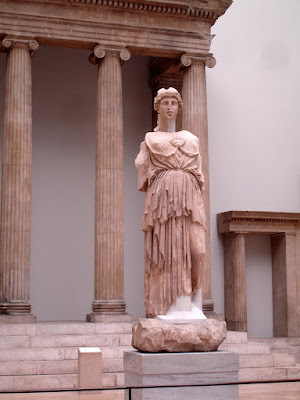 I really would like to go back to all these museums; one visit was not enough! 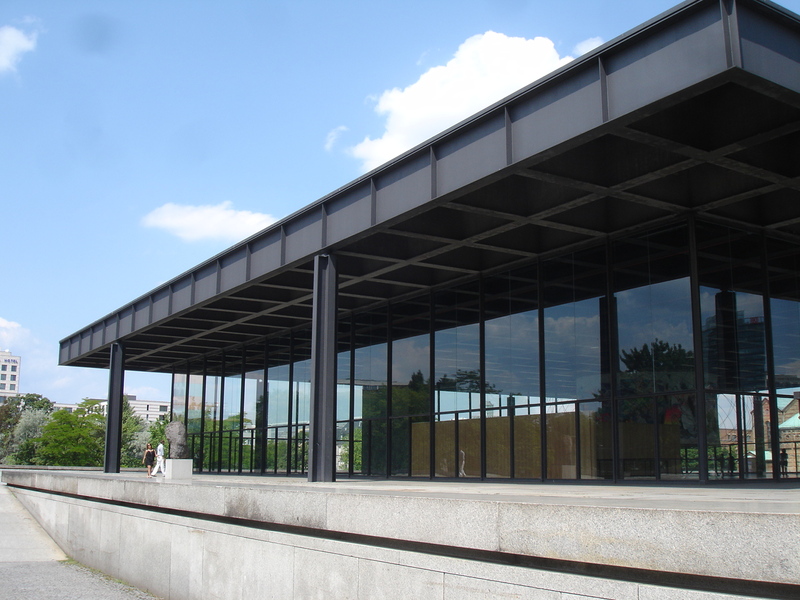 What the museum website refers to as "a temple of light and glass" designed by Mies van der Rohe. We also visited the much praised Jewish Museum. Unfortunately, the latter was something of a disappointment. 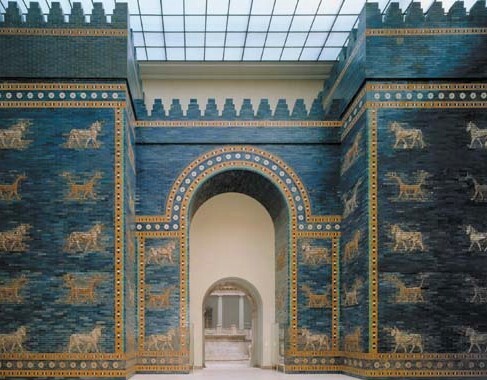 Since the museum was supposed to be a history of German Jews, both Rick and I expected the museum would highlight the cultural contributions of German Jews to German science and culture. It seemed (to us) that the museum focused on the persecution of German Jews but neglected the contributions. Someone told Rick that these contributions were part of the permanent exhibit but we somehow missed them. I hope that’s the case. Absent another trip to Berlin we’ll never know. I hope we manage to get to Berlin one more time. I had not expected Sapphire’s The Kid to be so difficult to get through. After taking a break from the BlogHer book club I decided to sign up to review Sapphire’s The Kid. I was drawn to this book because I appreciate Sapphire’s drawing attention to a world so many people refuse to think about -- a world of extreme poverty, children no one wants, trapped in a nightmarish foster care system. I had not expected The Kid to be so difficult to get through. If anyone would like my copy of The Kid , let me know. This is a book I will not re-read. My initial reaction to Berlin was not all that positive, but the city grew on me. 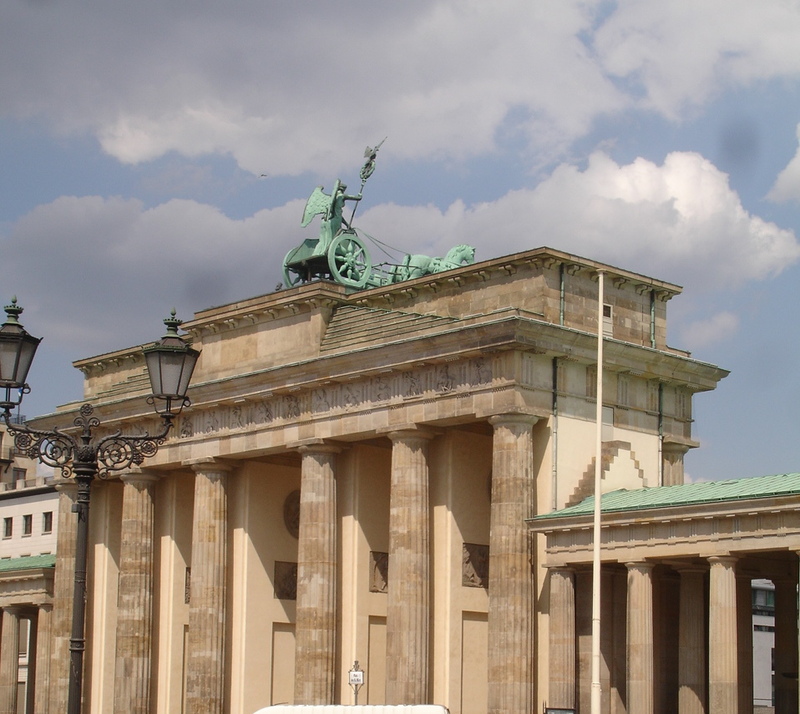 Berlin is not one of those beautiful cites you instantly fall in love with--like Paris, Rome, Lisbon. Berlin may not be beautiful, but it is exciting and has tremendous cultural resources, kind of like NYC. This time it was much worse. 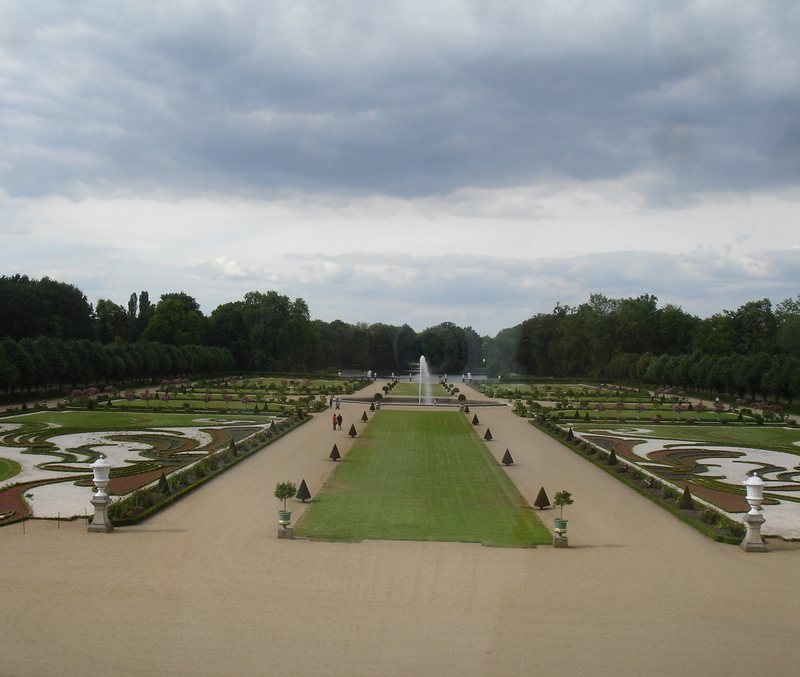 Time-Out recommended a garden hotel in a quiet section of the former East Berlin. The photos of the garden were really inviting, and since we planned to stay in Berlin for six days we booked a suite for 189 euros. When we arrived, exhausted from the train trip from Warsaw, we learned that our hotel was a 6th (!!!) floor walk-up. The hotel staff told us than our confirmation included an attachment stating the hotel had no elevator. (I’ve since checked the email—there was no such attachment.) The annoying 20-something woman at the front desk told us it should be no problem to walk up those steps. Maybe for her it would be no problem! Since having a heart attack while struggling up 6 flights of stairs was not the way we planned to celebrate Rick’s 70th birthday, we refused. The young woman showed us the only other room available—what amounted to an ugly little closet. She was clearly trying to push us into accepting the 6 flights of stairs. We said no way to the closet and then she said she could arrange something in a “sister” hotel, which had an elevator. The room was in a ramshackle, unrenovated part of the hotel and the suite consisted of a dark, dispiriting sitting room/bed room and a large kitchen with table ware for about 15 people! It must at one time have been part of an apartment—not a hotel suite as we generally understand the term. It looked as if it had not been occupied for a long time. When the staff managed to get the primitive hot water system to work, the water was ugly dark brown—a clear sign the system had not been used in a while. There was no air conditioning—a problem as Berlin was experiencing a heat wave; internet access was spotty—I was disconnected every 3 minutes; there was no phone in the room. Despite the ugliness and lack of amenities, the hotel was charging the same rates as their much larger and much more attractive 6th floor walk-up. The management wanted to get their 189 Euros a night. The hotel told us they could accommodate us, but when we arrived we found that the elevator was broken and we were forced to walk up what I think was 8 flights of stairs! (The hotel was on the top two floors of the building.) I demanded they find us another hotel. Who would have thought that it would be so hard to find a small charming hotel with an elevator in Berlin? The manager found us a small, modern hotel in a convenient West Berlin location in the heart of the gayborhood, with an elevator, air-conditioning, internet access, and a laundry service for 119 euros—-much less than the charming old world hotels. So we settled into our air-conditioned hotel with a comfortable bed (unlike the rickety bed with a lumpy mattress in our former over-priced hotel). There may be a lesson here. At this stage of life, a few basic comforts, like an elevator and air conditioning, matter more than funky charm. It’s nice to get both, but if I have to choose, I’ll opt for the air-conditioning and the elevator. Thanks to Rick’s illness we spent a lot of time hanging out on Old Town Square people- watching, a great opportunity for sociological observation. 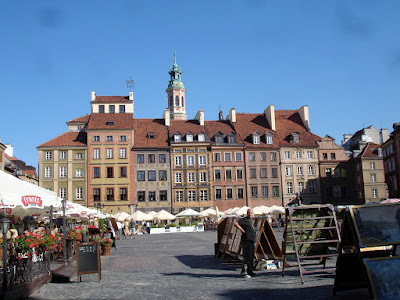 There appear to be far fewer international tourists in Warsaw than in Krakow and most of the people in the square were Poles; it seemed like most of Warsaw come out to the Square on warm summer nights. Some observations: I aren’t seen so many young pregnant women in a long time. Polish women apparently are not in synch with the trend of delaying childbirth, increasingly common throughout the developed world. Also there are signs of increasing gender equality: many young men pushing baby carriages and equally involved in taking care of young children when families are in restaurants/cafes. Of course, who knows what this really means for work/ home life balance among young Polish women and men, but if behavior in public spaces is any indication, conventional gender roles are changing. On a less happy note, I was surprised at how many older people were walking about the square alone. The activity in the square reminded me of the Italian custom of the passeggiata—when some time in the early evening everyone in the town takes a stroll round the square. (However, in Italy I can’t remember seeing anyone walking alone.) My guess is that these were widows and widowers who used to come to the square with their spouses, and still want to come out on a warm summer night rather than sit home alone watching television. Of course, I have know way of knowing if my fleeting observations are grounded in the reality of Polish life, but it's fun to speculate. We didn’t see much of Warsaw outside of the historic district, but the little part we saw, we really got to know. 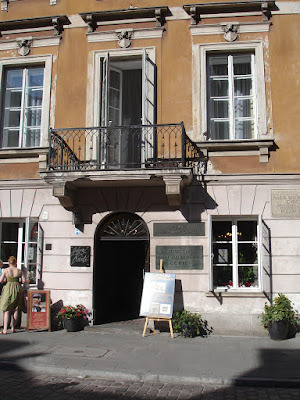 We missed the National Museum and the Warsaw Ghetto Uprising Museum, but at least we did see the fascinating small Madame Curie(AKA Maria Sklodowska) Museum located a few blocks from our hotel. The museum has inspired me to read the biography of Madame Curie written by her daughter. Rick has read it and highly recommends it--one of those wonderful by-products of travel, all those new interests to pursue! 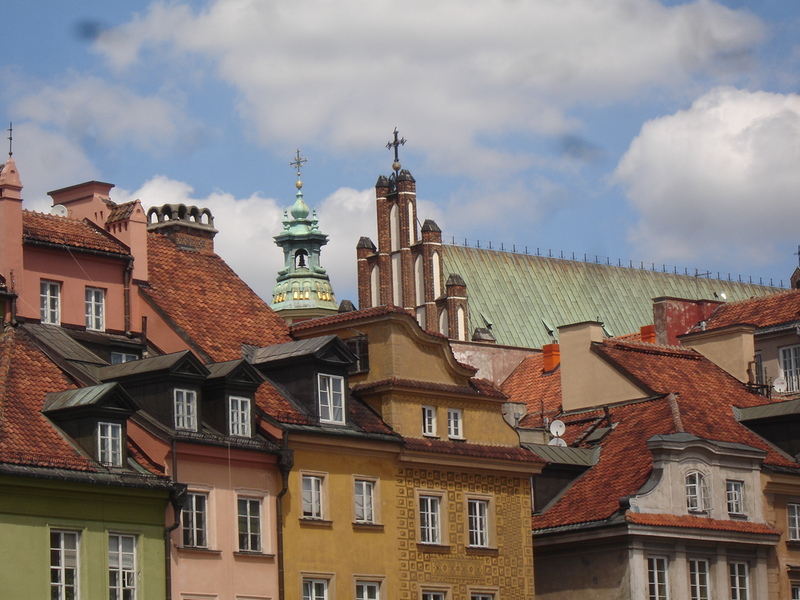 Rick and I had thought of Warsaw as a stop between Krakow and Berlin, not a destination. We were wrong. Warsaw’s spectacularly reconstructed Old Town, dating from the early 13th century, and the adjacent New Town, dating from the early 15th century, definitely make a trip to Warsaw worthwhile. We wound up spending three days in Warsaw rather than two as originally planned thanks to being unable to get at a train reservation for Berlin. 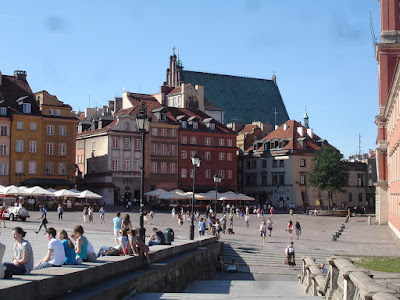 We had no idea that these reservations had to be made days in advance, so we wound up in Warsaw for 3 days. Sometimes what at first might seem like a travel mini-disaster can turn out to be serendipitous. So it was with Warsaw. First, the hotelMamaison Hotel Le Regina Warsaw turned out to be one of the best we ever stayed in. With a first-rate French restaurant, I’m sure it would have cost twice as much in most European capitols. We had a large comfortable room with a small private patio. This turned out to be a real blessing, as Rick got sick and we spent a lot of time in that room—-Rick in bed and me on the patio reading. Despite my worry about Rick, I really enjoyed relaxing on that patio. I was trying hard to repress my fear that Rick’s intestinal problems might be e. coli. We had been traveling during the time of the e. coli outbreak in Northern Germany and had been scrupulously avoiding cucumbers—-supposedly the source of e. coli bacteria. I avoided salad greens altogether except for gorging on bean sprouts. It turned out that the culprit was not cucumbers after all, but—-you guessed it--bean sprouts! Despite eating all those bean sprouts, neither one of us was stricken by e. coli and Rick gradually began to recover. One of the downsides of travel (for me at least) is the constant pressure to be doing something. Here we were in Poland, a country we might never visit again. How could I justify hanging out for a bit, reading newspapers, checking email etc? The silver lining in Rick’s illness was that break from sight-seeing we’ve always found so hard to justify. One of the many advantages of our beautiful hotel was that it was right on the edge of the historic district and Rick could venture out briefly, see some of the sites, and return to the hotel for another nap. The historic district was truly amazing. The Nazis destroyed the entire district at the end of the war. The Red Army was advancing and the Nazis decided to destroy Warsaw out of pure vindictiveness, rather than for any strategic reason. According to the guide on our half-day city tour, Goebbels claimed that Warsaw had been so reduced to rubble that it could never be rebuilt. 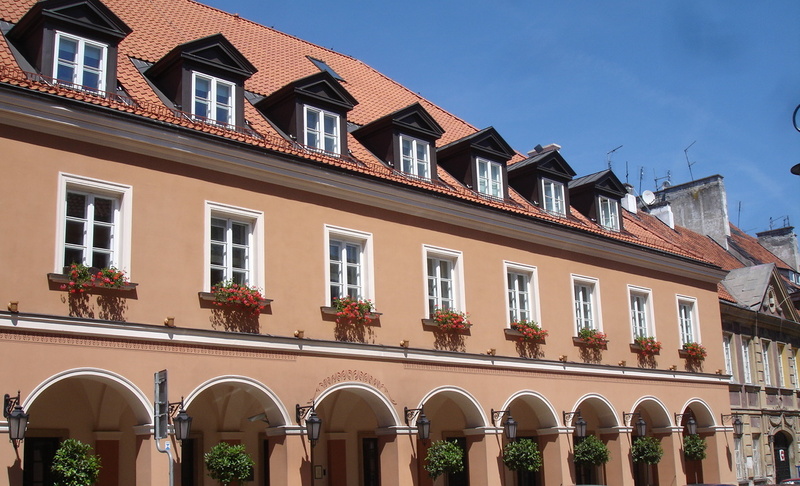 The Poles rose to the challenge and achieved a spectacular reconstruction of the historic district. We had seen the reconstructed town square in Frankfurt (Main), and it was so obviously a fake we came to the conclusion that such reconstruction could not be done. The best that could be hoped for would be a Disneyworld facsimile. 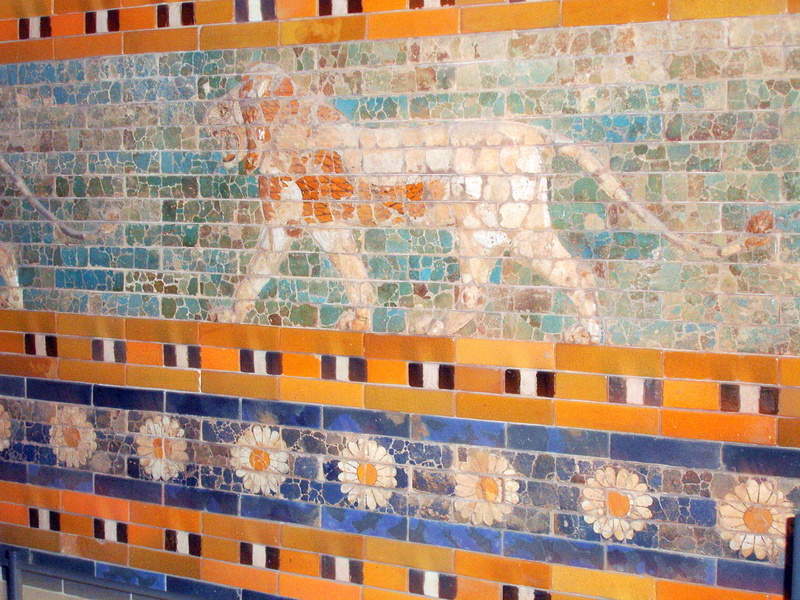 The Polish restorers proved us wrong!